The "Ship to" option is built in to the system, but is ignored for that product. PGR logo with "Standing for those who stood for US ®"
NOTE: Shipping is free for purchases of the coins alone. Shipping costs still apply if you order other items. Your invoice will show that the coins will be shipped to you; but our distributor has instructions to set these aside for shipment to our heroes. 9/1/2016 – The drop down says ship to "yourself". says the same in cart. Thought it says sent direct to wounded soldier (?) Can you . . . 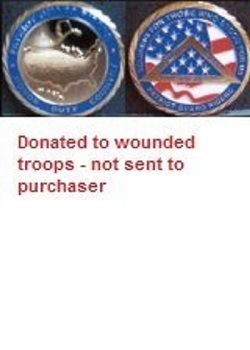 Wounded warrior coins are only shipped to wounded warriors. That drop down menu box is a "standard" of our software and can not be eliminated unfortunately. The PGR has been requested to offer this program as a recurring contribution system. Members who wish to participate will have the number of coins they've selected automatically reordered based on their subscription choice. Note: Because of technical restrictions, at this time we cannot offer PayPal as a payment option for subscription services.